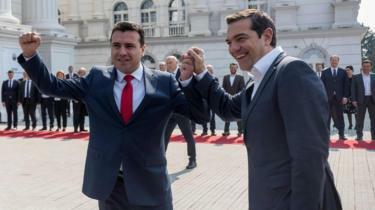 For the first time since Greece’s northern neighbour became independent in 1991, a Greek leader has visited the newly renamed North Macedonia. PM Alexis Tsipras completed a deal in January to end their three-decade name row, and the two countries are now seeking to boost their relations. Counterpart Zoran Zaev greeted him with a selfie outside government buildings. “The first prime minister of Greece to visit North Macedonia. Truly historic day,” he wrote on Twitter. The Greek prime minister was accompanied by 10 ministers and more than 100 business leaders. Tweeting the selfie, Mr Zaev referred to “happy moments for an even happier future for the peoples of our friendly countries”. 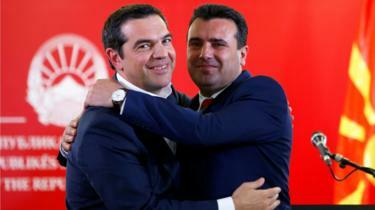 The two men signed a series of agreements before holding a joint news conference, in which Mr Zaev spoke of his opposite number as a “close, personal friend”. 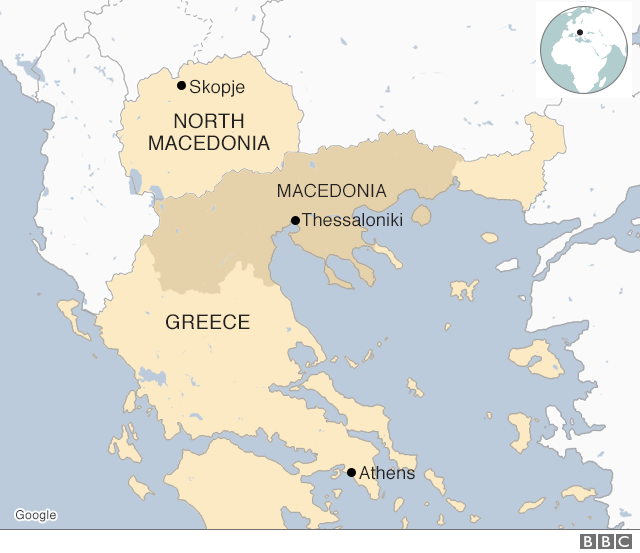 Greece had always objected to its neighbour’s use of “Macedonia”, because of the northern Greek province of the same name. 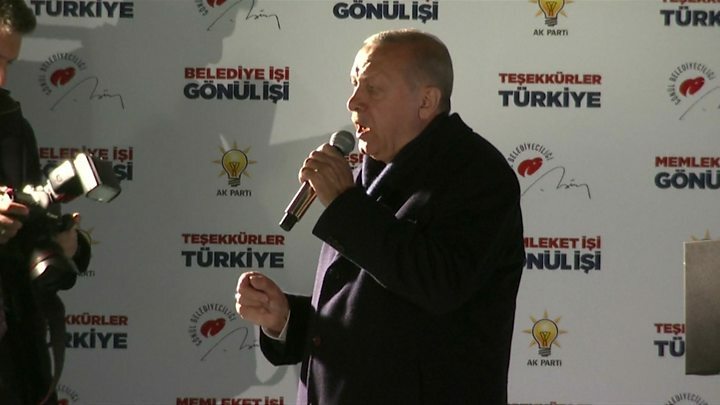 Under last summer’s Prespa accord, the two countries agreed that the Balkan state would become the Republic of North Macedonia, in return for Greece backing its long-stalled bids to join Nato and the European Union. The deal came into force in February, after ratification by both parliaments, and North Macedonia hopes to join the Western military alliance soon. Arriving in Skopje, Mr Tsipras said the “historic visit” began by crossing the Friendship motorway, whose name was changed from Alexander of Macedonia motorway in February 2018 as part of efforts to improve relations. Greeks long accused their neighbours of trying to appropriate the ancient heritage of Alexander and of having territorial ambitions. Mr Zaev said there would be big economic benefits from the deal with Greece. The two leaders convened the first co-operation council between the neighbours and they agreed to open a second border crossing. Under the deal, a joint committee of experts has been formed to assess possible bias in school textbooks, and Mr Tsipras said their consultations had ended in a positive manner. Ahead of his arrival, Mr Tsipras gave an interview with North Macedonian media in which he acknowledged that “a significant portion of the Greek people was and still is seriously concerned about this issue”. An opinion poll late last month suggested 73% of Greeks “probably disagreed” with the Prespa agreement. He said he and Mr Zaev had a responsibility to show how both countries could build mutual trust and benefit from the new deal. Both leaders have endured difficult political opposition at home. Mr Tsipras faces elections later this year, with conservative leader Kyriakos Mitsotakis backing Greeks in the Macedonia region who he said felt humiliated by the agreement. Mr Zaev has himself been bitterly criticised by President Gjorge Ivanov. A cross-party group of MPs has put forward a bill to prevent a no-deal Brexit in 10 days’ time. If passed into law, the bill would require the PM to ask for an extension of Article 50 – which mandates the UK’s exit from the EU – beyond the current 12 April deadline. Labour MP Yvette Cooper presented the bill – which supporters hope they can pass through the Commons in one day. 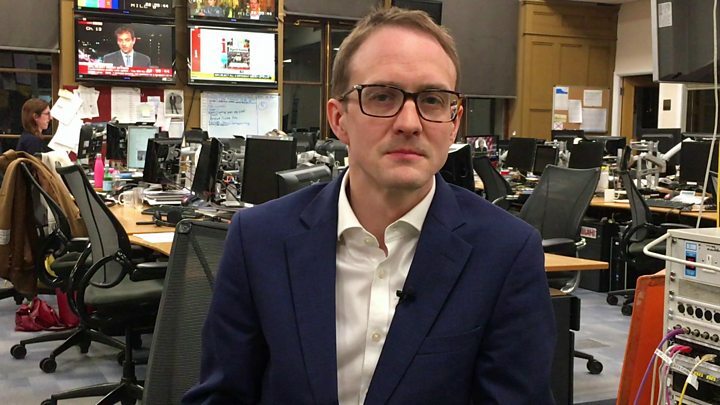 The BBC’s Emmanuel, said Theresa May’s ministers considered plans to “ramp up” no-deal Brexit preparations and a snap general election was also discussed. Ms Cooper’s bill would make it UK law for the PM to ask for an extension to prevent a no-deal, but it would be up to the EU to grant it – or not. Meanwhile, the EU’s chief negotiator has said a no-deal Brexit is now more likely but can still be avoided. France’s President Emmanuel Macron and Irish Taoiseach Leo Varadkar are meeting in Paris to discuss the impact of Brexit. President Macron told reporters that the EU “cannot be hostage to the political crisis in the UK”, and the government must come forward with “credible” reasons for an extension. Mr Varadkar said the UK was “consumed by Brexit”, but the EU should not be. He said the EU “needs to be open” about any proposals the UK brings, including a longer extension, and they will do what they can to “assist”. Tory MP Sir Oliver Letwin, who supports Ms Cooper’s bill, said: “This is a last-ditch attempt to prevent our country being exposed to the risks inherent in a no-deal exit. Ms Cooper said the UK was “in a very dangerous situation” and MPs “have a responsibility to make sure we don’t end up with a catastrophic no deal”. Speaking to BBC Radio 4’s World At One, she added: “We have been attempting to squeeze into just a couple of days a process that really should have been happening for the last two years – a process of trying to build a consensus around the best way forward. But – much to the government’s disapproval – MPs voted to allow backbenchers to take charge of business in the Commons on Wednesday. However, the bill would also have to be agreed by the House of Lords and receive Royal Assent before it became law – which if the Commons agrees it on Wednesday, could happen as soon as Thursday. Brexiteer Tory Sir Bill Cash said trying to go through these stages in one day made it a “reprehensible procedure”. 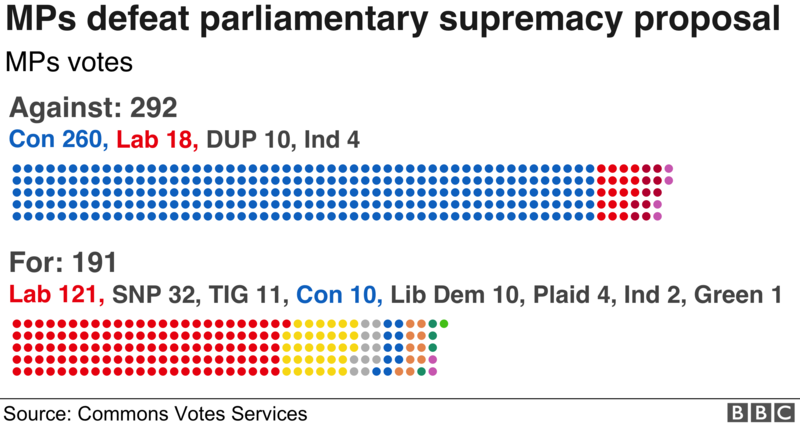 But Speaker John Bercow said that, while it was “an unusual state of affairs”, it was “not as unprecedented as he supposes” – citing recent bills on Northern Ireland that have been passed at the same speed. In the latest round of indicative votes on Monday, MPs voted on four alternatives to the PM’s withdrawal deal, but none gained a majority. Mrs May’s plan for the UK’s departure has been rejected by MPs three times. The European Union will not be hostage to a “political crisis” in the UK, France’s president has said. “We will never abandon Ireland or the Irish people no matter what happens, because this solidarity is the very purpose of the European project,” said Mr Macron. Mr Varadkar said any Brexit extension needed “a clear purpose, clear plan”. Their meeting came after MPs twice rejected Theresa May’s Brexit withdrawal deal, with the government now ramping up plans for a no-deal scenario. Mr Varadkar said he would also discuss the Republic of Ireland’s no-deal plans with Mr Macron. The taoiseach (Irish prime minister) emphasised that the EU should be open to any “credible proposals” the UK put forward about in the Brexit process. Mr Varadkar’s visit to France comes ahead of German Chancellor Angela Merkel’s trip to Dublin on Thursday. “There’s a view that a no deal would be a forever state of play from those that would argue for it, but frankly it’s not,” she said. 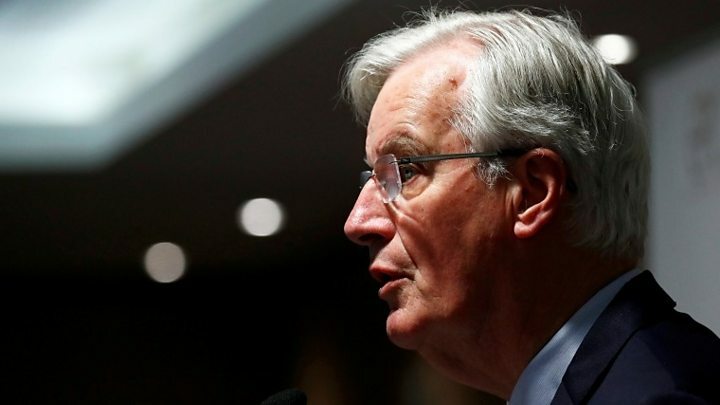 Earlier on Tuesday, Michel Barnier, the EU’s chief negotiator, said a no-deal Brexit is now more likely but can still be avoided. The party’s deputy leader Nigel Dodds said if the Irish border backstop was addressed, the DUP could “do business” with the government. 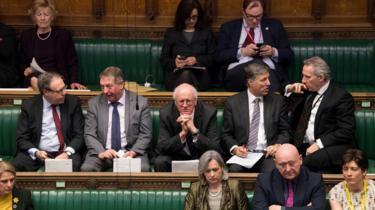 Speaking after the indicative votes, Mr Dodds said the only proposition that MPs had ever supported was an amendment – known as the Brady amendment – calling on the government to negotiate changes to the backstop. 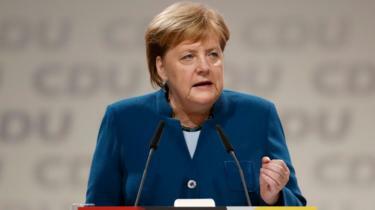 German Chancellor Angela Merkel will visit Dublin on Thursday, as pressure mounts over Parliament’s failure to ratify the withdrawal agreement. US safety authorities will investigate nearly three million Hyundai and Kia vehicles over fires, in a move which could prompt mass recalls. The inquiry by the National Highway Traffic Safety Administration (NHTSA) follows thousands of complaints about the “non-crash fires”. Incidents involving fires are linked to one death and more than 100 injuries. It raises fresh safety concerns with the South Korean automakers, which have already been subject to US scrutiny. The NHTSA said fire issues and engine problems have affected around six million Hyundai and Kia vehicles since 2015. So far, only about 2.4 million have been recalled for repair. The latest investigation relates to Hyundai Sonatas and Hyundai Santa Fes, as well as Kia Optimas, Kia Sorentos and Kia Souls. Both automakers said they were co-operating with the investigation. It was launched by the NHTSA after a petition from consumer advocacy group the Centre for Auto Safety. “Hopefully, this step will quickly lead to a recall being issued as soon as possible. South Korean prosecutors are conducting separate investigations into the carmakers over the recalls. 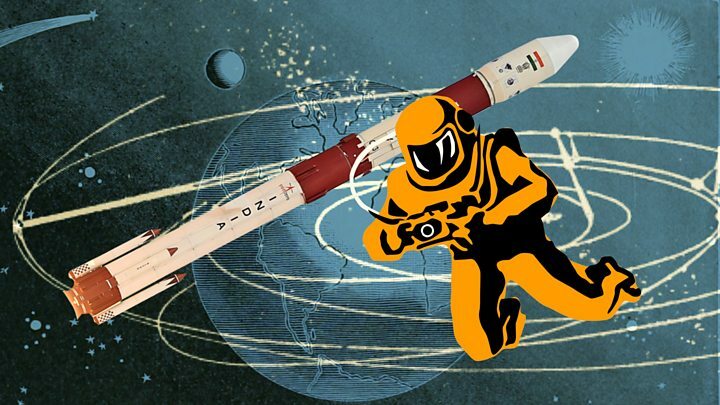 Is India’s prime minister right when he calls his country a space superpower? China provoked international alarm with a similar test in 2007. The Nasa chief said “a lot” of the debris created by that test remained in orbit. The US military is in total tracking about 10,000 pieces of space debris, nearly a third of which is said to have been created by the Chinese test. Police have named a suspect in the murder of Los Angeles rapper Nipsey Hussle, hours after a stampede at a vigil injured at least 19 people. Most people suffered “trample injuries” at Monday’s vigil, a fire official said, as crowds tried to rush away. Two are critically hurt and two seriously, with the rest suffering “non-life threatening injuries”. One of those critically injured suffered “penetrating, traumatic injury with cause unknown”. Footage from the scene shows mourners suddenly breaking and running from the scene. It is unclear what triggered the incident. Police earlier asked for people to “disperse from the immediate area” and moved in to restore order, reportedly using riot gear and forming containment lines. Reports of shots fired at the vigil “do not appear to be accurate”, the police tweeted. Nipsey Hussle was shot dead outside his clothing shop on Sunday. Two other people were wounded. Tributes have poured in for the 33-year-old, whose debut album Victory Lap was nominated for best rap album at this year’s Grammy Awards. On Monday night, MPs voted on four alternatives to the PM’s withdrawal deal, but none gained a majority. Michel Barnier said a long extension to the UK’s current 12 April exit date carried “significant risks for the EU” and that a “strong justification would be needed” before the EU would agree. Theresa May is set for five hours of cabinet talks to tackle the deadlock. MPs rejected a customs union with the EU by three votes while a motion for another referendum got the most votes in favour, but still lost. That did not happen, however, and one Tory MP – Nick Boles, who was behind one of the proposals – resigned the whip in frustration. One suggestion has been the possibility of a general election – but former foreign secretary Boris Johnson told BBC political editor Emmanuel that would likely “infuriate” voters. Instead, Mr Johnson said he believed a new leader and “change in negotiation tactic” could “retrofit” the PM’s “terrible” agreement with the EU. Labour MP and chairman of the Brexit select committee Hilary Benn told BBC Radio 4’s Today that a confirmatory referendum was the best solution. 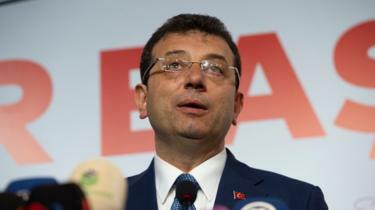 “A good leader would be taking that decision and put it back to the people,” he said. Motion C: Committing the government to negotiating “a permanent and comprehensive UK-wide customs union with the EU” as part of any Brexit deal. Motion G: Aiming to prevent the UK leaving without a deal, including a vote on whether to revoke Article 50 – stopping Brexit altogether – if the EU does not agree to an extension. 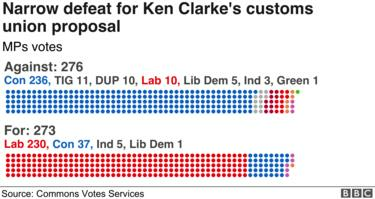 Those pushing for a customs union argued that their option was defeated by the narrowest margin – only three votes. It would see the UK remain in the same system of tariffs – taxes – on goods as the rest of the EU – potentially simplifying the issue of the Northern Ireland border, but prevent the UK from striking independent trade deals with other countries. Mr Barclay said the “only option” left now was to find a way forward that allows the UK to leave the EU with a deal – and the only deal available was the prime minister’s. Health Secretary Matt Hancock agreed it was time for Mrs May’s deal to be passed. But Labour leader Jeremy Corbyn said that while it was “disappointing” that none of the proposals secured a majority, he said he wanted to remind the Commons that Mrs May’s deal had been “overwhelmingly rejected”. For months, Parliament has been saying “Let us have a say, let us find the way forward,” but in the end they couldn’t quite do it. Parliament doesn’t know what it wants and we still have lots of different tribes and factions who aren’t willing to make peace. That means that by the day, two things are becoming more likely. One, leaving the EU without a deal. And two, a general election, because we’re at an impasse. One person who doesn’t think that would be a good idea is former foreign secretary and Brexiteer Boris Johnson. What did Monday night’s Brexit vote mean? BBC Europe editor Mr Ben Rory, said the mood in Brussels was one of disbelief – that the UK still does not seem to know what it wants. She said EU leaders were also questioning the logic of arguing over things like a customs union or Common Market option at this stage, because right now, the UK has only three options as they see it – no deal, no Brexit or Theresa May’s deal – and anything else is a matter for future talks once the UK has actually left. 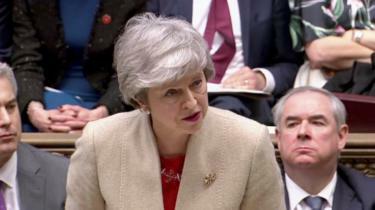 The rejections came during a second round of votes in the House of Commons on alternative proposals to Prime Minister Theresa May’s Brexit deal. Mrs May’s deal has been rejected on three separate occasions so far. The Commons has been attempting to find a strategy that can gain majority support. 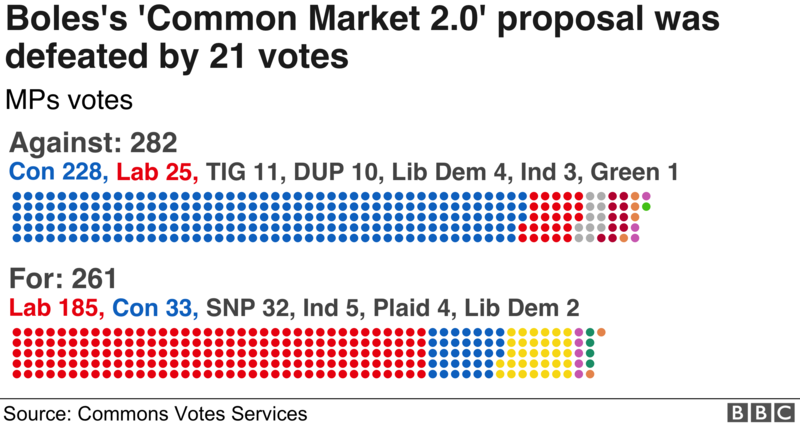 The second series of votes on Brexit options – known as “indicative” votes, designed to see what MPs might support amid the deadlock – were held on Monday evening in the House of Commons, the main decision-making body of the UK Parliament, following hours of debate. The option that came closest to being passed, which was defeated by just three votes, was remaining in a customs union with the EU – a key plank of the so-called “soft Brexit” option, under which the UK would leave the EU but retain very close trading links with the bloc. Its supporters say it would mitigate the damage caused to the British economy by Brexit, particularly if combined with staying in the EU’s single market. Detractors say such an option in effect means not really leaving at all, as the UK would be subject to EU rules and regulations it had no say over. A customs union would also limit the UK’s ability to strike its own trade deals with non-EU countries. 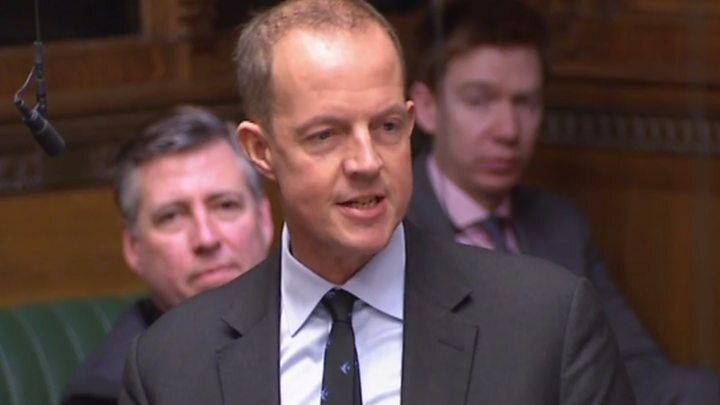 Nick Boles, the Conservative MP who proposed the Efta/EEA motion – the so-called “Common Market 2.0” option – resigned from the party immediately after the vote results were announced. Mrs May and her government would not have been obliged to act on any of the MPs’ decisions – even if they were passed by a majority – as they do not have the force of law. Whether there will be another attempt to find a majority for one of the options – a move supported by Leader of the Opposition Jeremy Corbyn – to then allow a “run-off” vote between that option and Mrs May’s deal is unclear. If nothing is passed by the Commons, Britain is due to leave the EU without a deal on 12 April. Many MPs and business leaders fear a no-deal or “hard” Brexit could cause chaos, at least in the short term. Although a no-deal exit has been regarded as unlikely, given the opposition of most MPs, by what method this can be avoided – and even who will be in charge of the process – is uncertain. Many in the EU now regard a “no deal” Brexit on 12 April as the most likely outcome. If MPs pass Mrs May’s deal, Britain would have until 22 May to leave – after the EU granted an extension to the original exit date of 29 March. Any later than that – for, say, a general election to create a new House of Commons that would possibly be able to break the deadlock – would require the EU to agree on a lengthy extension of the period before Britain is due to leave the bloc. The European Council – the main decision-making body of the EU, made up of the leaders of member states – is due to meet on 10 April, to decide – if necessary – whether the conditions for a longer delay have been met. There is a third option: the UK could revoke the so-called Article 50 and cancel Brexit altogether – but this appears very unlikely. Monday’s votes were the second round of a process that got under way last week after Mrs May’s government was defeated in a vote that allowed MPs to seize control of business in the chamber from the government for two days. Last Wednesday, eight Brexit alternatives were all rejected, but Monday’s second round was scheduled amid suggestions there could be majority support for at least one of them. Four of the eight new options proposed on Monday were selected by Commons Speaker John Bercow. The third defeat of Mrs May’s agreement came last Friday. Whether Mrs May will still be PM over the next few weeks is also up in the air. She pledged to stand down if her deal passed, but many now question whether she has the authority to stay if it doesn’t. It is worth remembering that the debate now is focused on the terms of the UK’s exit from the EU. The conditions of the future relationship between the country and the bloc, assuming the UK leaves at all, still have to be negotiated.